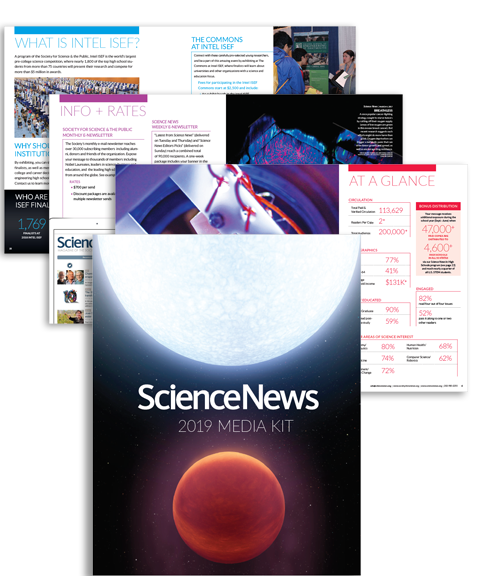 Science News is the award-winning, trusted source for clear, credible and concise news in all areas of science. The biweekly print magazine and companion digital replica edition reach over 113,000 subscribers and over 200,000 readers. Each month our companion websites, ScienceNews.org and ScienceNewsForStudents.org, reach over 1.1 million and 500,000 unique visitors, respectively - a readership driven by an engaged social media audience that includes 2.7 million Facebook and 2.8 million Twitter followers. Your message will also reach the 4.1 million STEM students and educators who have access to our Science News in High Schools program, which provides ten copies of each issue along with corresponding educator guides to 4,650 high schools in all 50 states and D.C.
Our Science News and Science News for Students e-newsletters reach a combined total of over 110,000 recipients, and the Society's monthly e-newsletter reaches 30,000 Science News subscribing members and alumni, donors and friends of SSP. To learn more about how we can make Science News work for you, Email a Science News ad representative or call (202) 872-5127. SCIENCE NEWS ADVERTISING GUIDELINES: All advertising is subject to the approval of Science News. Science News may refuse any advertisement deemed unsuitable for publication in Science News or on ScienceNews.org at its sole discretion for any reason whatsoever. All ads published in Science News must comply with applicable U.S. and International laws, and may not be indecent, obscene, defamatory, fraudulent or misleading. Advertising may not represent that Science News in any way endorses the Advertiser and/or the Advertiser's products or services. Advertisers and agencies agree to hold Science News harmless from any and all claims or suits arising out of advertising published.